The Outdoor classroom is on track, in time to bring learning outside for the Autumn. 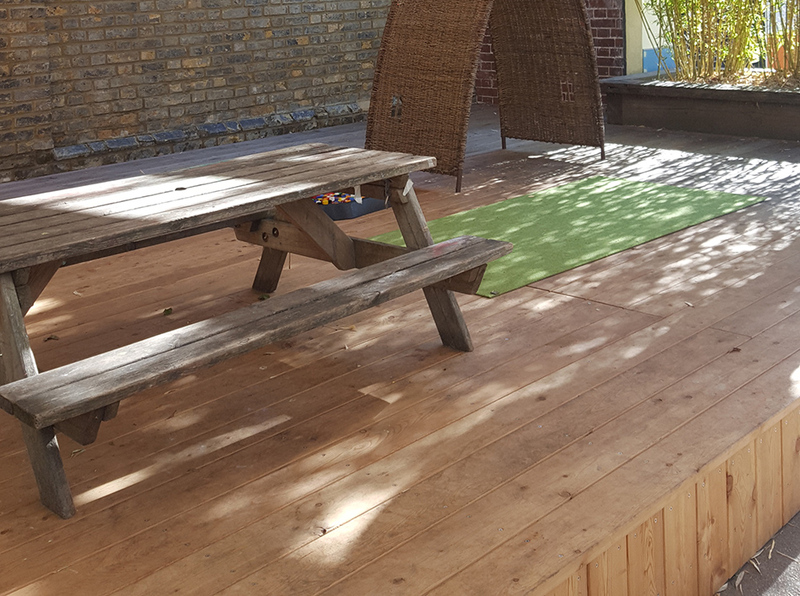 We checked in with our client in Highgate Primary school last week and are delighted to see that the main platform of the outdoor classroom that we designed for them has already been installed. The image below shows the platform, made from larch, measuring 35sqm. We proposed the designs in 2017 but sadly the project had to be put on ice due to lack of funding, so Partner at Collective Works, Siri Zanelli, lead that charge on sparking up a partnership with Omved Gardens – an organisation in Highgate which promotes well-being, amongst other things. Omved Gardens sponsored a fundraising supper and auction at their stunning glasshouse location in the secluded gardens about 10 minutes from Highgate Primary school. 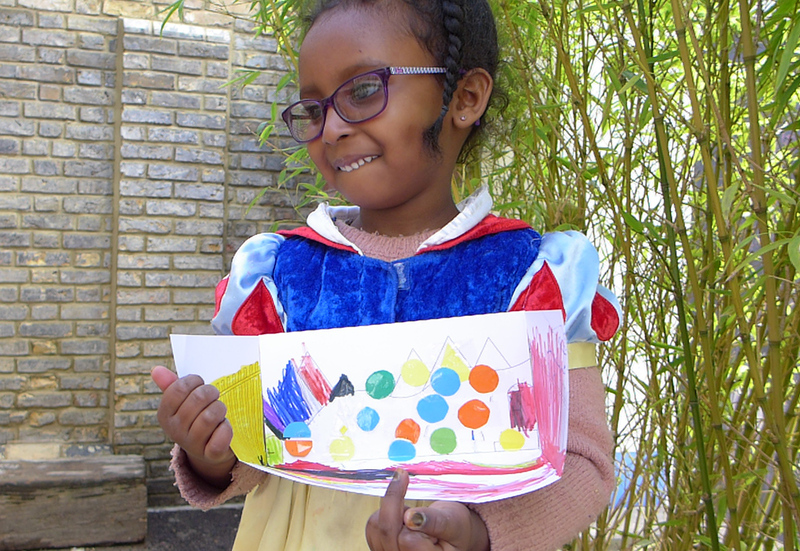 To inform our design we facilitated an ideas workshop the with kids on colour, shapes, landscape and why learning outside is different from learning inside (“we can shout and run!”). This all added life to the abstract landscape. The children saw trees, flying comets, beaches and erupting volcanoes, and were excited about small secret doors where no adults are allowed. 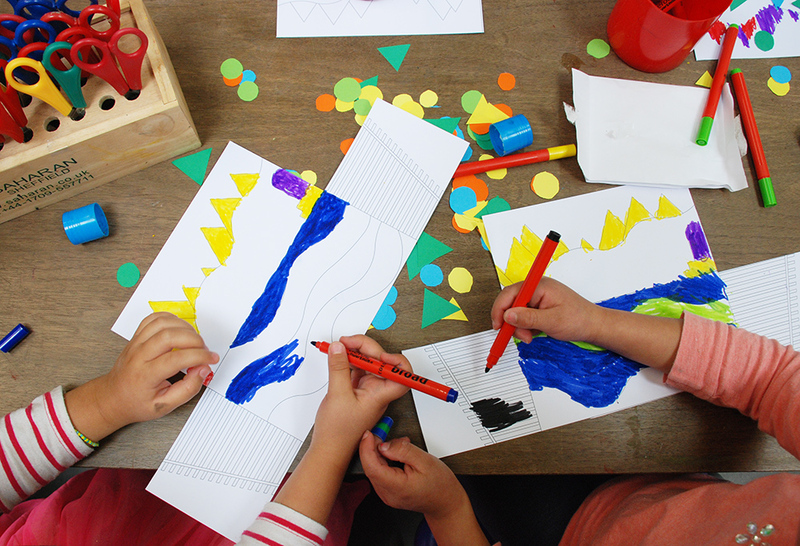 A non-prescriptive space is open to any interpretation and any use, and becomes a perfect place to learn and play. The outdoor classroom will transform a small underutilised space outside of their reception and nursery rooms into a much needed multi use flexible space that could be used by small groups of children to do activities such as reading, arts and crafts, or listen to storytelling. The space will also be somewhere to put on a show, spontaneously, or to practice for school assemblies and performances. A bonus would be giving parents a comfortable place to wait at drop off and pick up times. The design also incorporates several foam stools for learning sessions. These can be stacked or used as building blocks, arranged at different heights to allow for a climbing route up and over with different views of the rest of the playground. When the stools are in use, the space which they are normally stored in becomes a perfect little hiding place that is too small for adults! 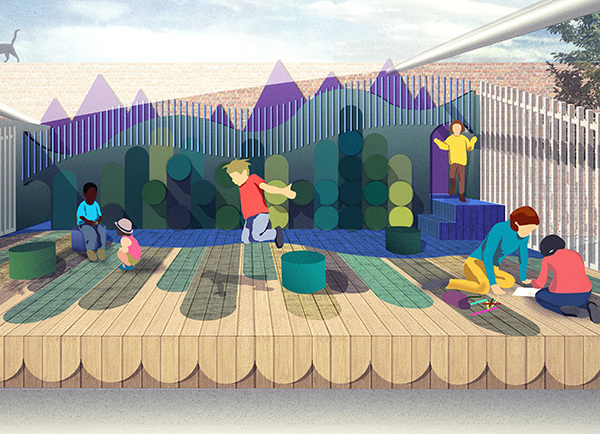 By moving away from the catalogue sets of play equipment, we have designed a space that creates its own narrative, and is enjoyable for children and adults alike.